1913 Bath House Inventory, p. 39, no. 216, in the Red Room, in the 'showcase to the left of the fireplace'. 1914 Wernher Inventory, p. 39, no. 202. 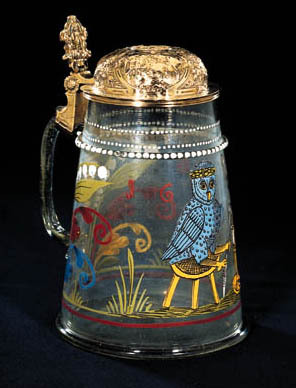 Another glass tankard also mounted in silver-gilt, but with the slightly earlier date of 1592, is in the collection of the Victoria & Albert Museum, London (W. Buckley, The Art of Glass, London, 1939, pl. 67, no. 248, C.313-36). The form of the tankard is similar to two illustrated by B. Klesse and A. von Saldern, (500 Jahre Glaskunst - Die Sammlung Biemann), Zurich, 1978, p. 317, no. 270 and p. 328, no. 388.